This year’s summer excursion was pure driving fun. On 29.07.2016 we made our way to Steinwiesen for the ultimate driving fun tour on the Segway and afterwards on the summer toboggan run. Early in the morning we had a coffee and a piece of cake in the office. Then we started to Steinwiesen for the ultimate driving fun tour. 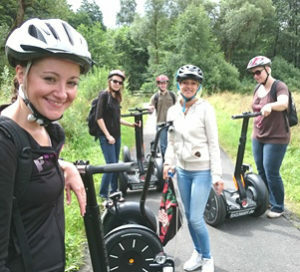 After the introduction into the operation of the Segway we set off from stone meadows over Wallenfels to Fels. On the 14 km long distance we could really ride our two-wheelers. In Wallenfels we made a short stop at the lock and were amazed at the rafts. The raft trips on the Wild Rodach are well known in the region. Arrived at the Gasthof Fels we took a break and had a delicious lunch. On the way back we could really enjoy the beautiful nature again. After a total of 28 km we have returned to Steinwiesen. On our way home we spontaneously had the idea to make a stopover at the summer toboggan run in Frankenwald near Kronach. There the lift pulled us 250 meters up the mountain before we went downhill again at high speed on the winding track. Finally, there were delicious sundaes and coffee in the ice cream parlour next door. The pharmadocs summer excursion was a great experience for everyone and has strengthened our team spirit even more.